“Other box? What other box? !” I say to myself (aloud, because we WAHMs totally talk to ourselves) and hurry over to investigate. Lo and behold I had 68 unread messages. How did they get there you ask? Apparently messages from unconfirmed Facebook friends and the scurge of the internet end up there. Who knew? I surely didn’t and I’m not alone; not many others seem to be aware of this inbox cloaked in shadows either. Oh happy day, Richard from creepy cyber space is “interested on me.” I will be sure to accept his friendship invitation because as he so eloquently said, “friend are life time investment.” Special, special times. And how about this classy gem? On second thought, it’s too gross to share. It’s unnerving when somebody takes the time to address you by name to ask a question that warrants washing their mouth out with soap. I also got a message from someone I actually know/like who needed a favour…in February, 2012. And, received a request for interview. The deadline was October 18th, 2011. 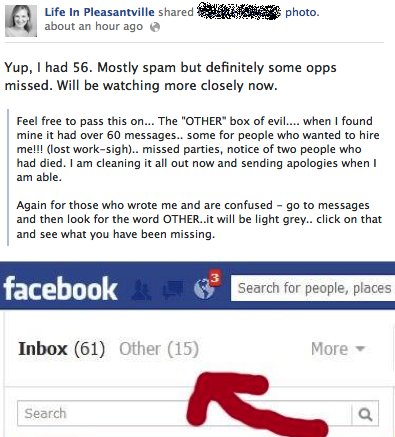 Next time you’re on Facebook, check your “OTHER” box…if you dare. I’d love to hear about the messages you have waiting for you there.